The HP LaserJet 4200DTN comes standard with 64 MB RAM, an HP JetDirect card for connecting to a network, two 500-sheet trays, and a LaserJet 4200 duplexer. Plus, we beef up this printer with 2 custom upgrades that you won't find anywhere else--see details below! 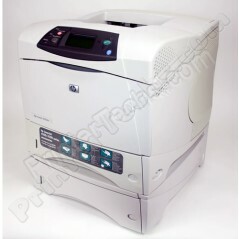 Other models in this series include HP LaserJet 4200 , HP LaserJet 4200N , HP LaserJet 4200TN. The HP LaserJet 4200DTN comes standard with 64 MB RAM, an HP JetDirect card for connecting to a network, two 500-sheet trays, and a LaserJet 4200 duplexer. Also features our custom upgrades, two huge improvements to HP's original design!